No country house or cottage can do without a wooden staircase. However, with the external simplicity of the structure, many factors need to be considered before its construction: its location depending on the house's features, convenience and reliability of the structure, appearance, etc. 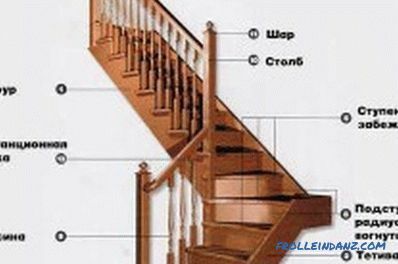 Wood is the most popular and practical material for building stairs. It is easy to handle, parts of the design easily connected to each other. 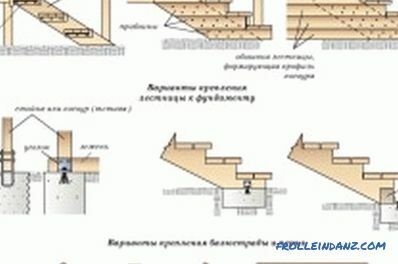 Scheme of manufacturing a wooden staircase on kosoura. Note that solid wood will last much longer, but its price is higher. Boards must be dry and free of knots and defects. Set the lighting above the stairs (especially the first and last steps). For convenience, the width of the staircase should be 0.8-1 m.
Avoid slippery materials for making steps. 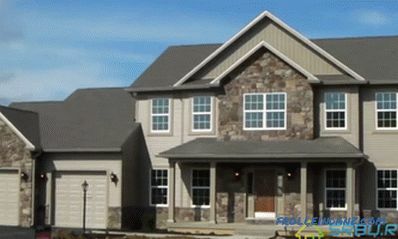 The design should have a tilt angle of not more than 38˚. The tread width should not exceed 25 cm. The steps should not have a slope. 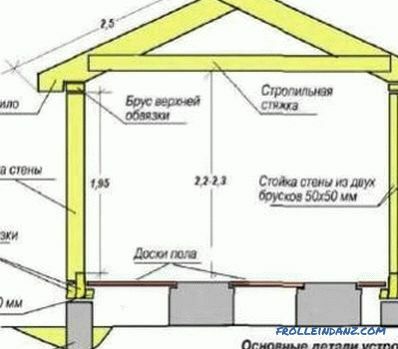 To begin, calculate the height of the structure. 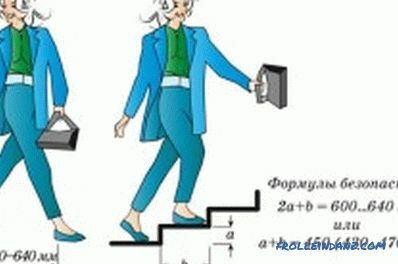 To do this, measure the distance from the floor of the 1st floor to the floor of the 2nd. The optimal height of the riser is 15-19 cm. 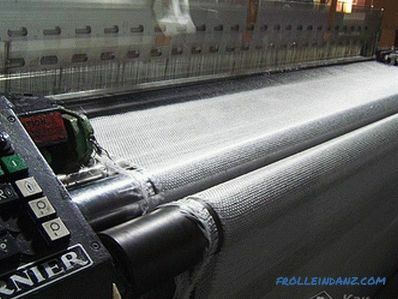 To calculate the number of steps, you need to divide the height of the product by the height of the riser. The resulting figure needs to be rounded. To calculate the length, the width of the tread must be multiplied by the number of steps. 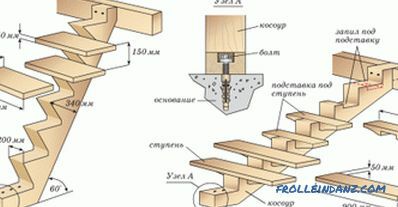 A beam intended for kosour, cut from above and below. You should get the desired length of the future product. Cut 5 cm from the bottom (1 tread thickness). After this you should cut openings for steps. On the square mark the height of the riser and the width of the tread, taking from it 2-4 cm. This marking should be transferred to the inside of the beam. Using a saw or jigsaw, remove all unnecessary. Put the kosour where you plan to place a wooden staircase. Its top should rest against the ceiling, and the bottom one - against the floor of the 1st floor. 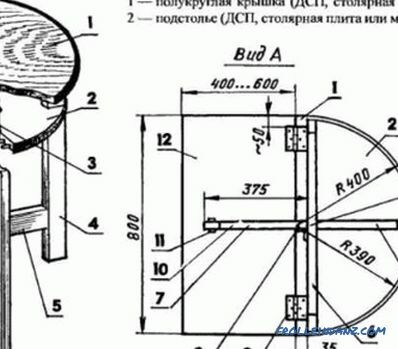 Kosourov should be two, the second is cut along the model. Surfaces need to be treated with sandpaper. If desired, the outer edges can be rounded. Below and above kosoura connect beam. To do this, they need to cut 1/4 of the bottom and top. Using anchor bolts, attach to a thick beam. If possible, you need to fix the kosoura to the wall, this is also done using anchors. If you use 1 string, you need to cut it to the desired length, and then cut holes for the steps inside. The string is also fixed with anchors to the wall surface. The formula for calculating a safe ladder. Next, start making steps and risers. Saw the beam into the required number of risers. They must be the same. After that they need to be sanded. From the outside, attach them to the kosor with self-tapping screws. Having completed the work with the risers, proceed to the steps. To do this, divide the beam into the required number of stages minus one. Sand them. Set on top of the risers and fix. After that you can install balusters. Secure the railing from above with screws. After completing all the work, you can start painting. You can use a clear lacquer coating. Making the stairs yourself is in many ways a creative process that requires certain carpentry skills. The choice of product design, material depends largely on personal preferences, and on the characteristics of a residential house.